Tis’ the season for get-together’s, potlucks, and football parties. Though, admittedly, in today’s fast-paced world, it can be hard to find time to do that. In my home, we like to do Sunday Funday. We invite friends and family over, and cook a delicious meal. There’s usually cheese involved. Lots of cheese. Granted, it doesn’t happen every Sunday, because of everyone’s busy lifestyle, but when it does, there’s a lot of laughter and memories made. That’s what it’s all about. Good food, good friends, and good memories. 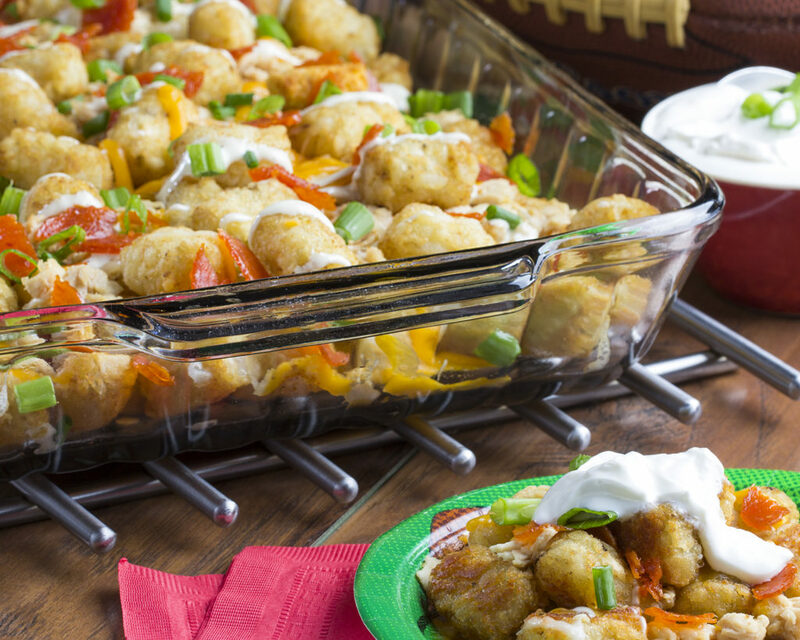 With the big game coming up, it’s the perfect opportunity to meet-up, cheer on our favorite team, and cook up some amazing appetizers. Good food is usually a major part of any social event–especially ones that involve sports. No matter the reason you’re getting together, a great recipe is usually in the mix of things. The aroma of certain foods bring us back to an old football party or Grandma’s kitchen. Today, I’ve got an amazing Huddled-Up Chicken Tots recipe. 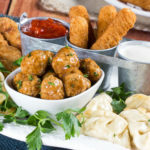 It’s a delicious appetizer that’s perfect for just about every occasion, but I guarantee they’ll be a touchdown at your upcoming big game party. 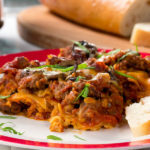 Friends and family will get off the sidelines and huddle-up around the table, making new memories as they devour this easy-to-make recipe. 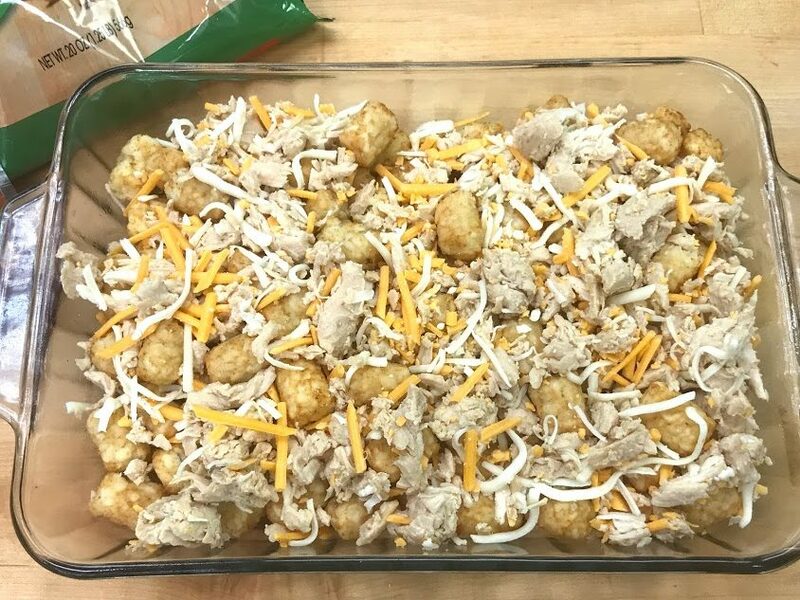 Gather your ingredients: frozen tater tots, thawed shredded chicken, pepperoni, shredded cheddar and mozzarella cheeses, ranch dressing, sour cream, and scallion onions. 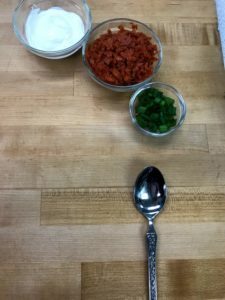 These ingredients make this dish so easy to make. Trust me, you’re going to love it when it all comes together–and your guests will crown you MVP of the big game. 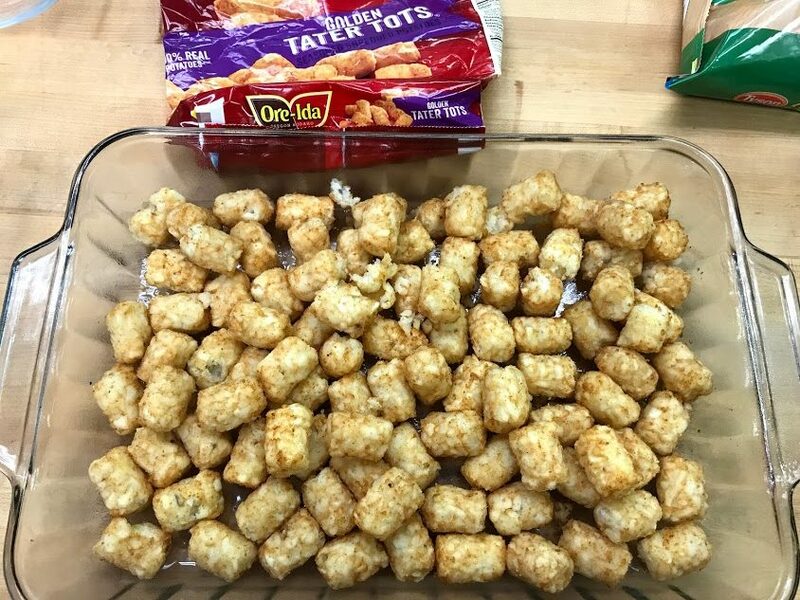 Spray your 9- x 13-inch baking dish with nonstick spray and then pour the tater tots in. Mix two cups of shredded chicken with 1.5 cups of mixed mozzarella and cheddar cheese. (Measure out a total of 2 cups of mixed cheese, but reserve .5 of a cup for topping.) 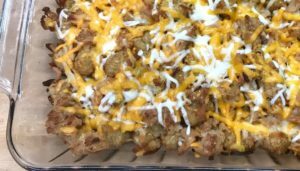 Once mixed, spread it over the top of the tots. Bake at 425° for 30 minutes or until tots are crispy. 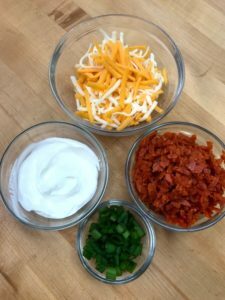 While that’s baking, chop up your scallion onions, 1 cup of pepperoni slices, and make sure the .5 cup of cheese and sour cream are ready to go. Once everything is ready it will be a cinch to finish up the Huddled-Up Chicken Tots when they come out of the oven. The great thing about this recipe, is that it’s an easy prep. 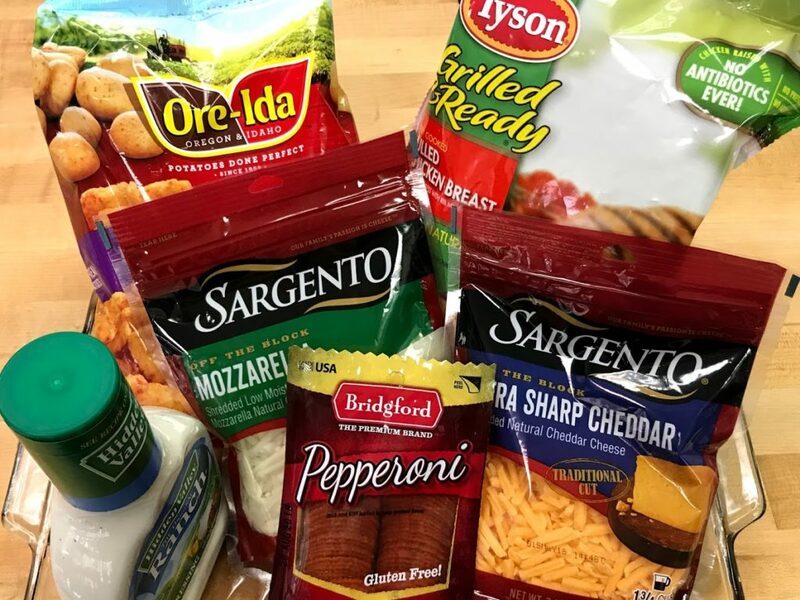 While you’re chopping the scallions and pepperoni, the delicious aroma of tots, chicken, and cheese will fill up your kitchen. At this point, even though the game is in full swing, you might notice that your guests are slowly inching closer and closer to the kitchen to find out just what’s cookin’. Now that your kitchen has been warmed up from the oven, the timer has probably gone off and it’s time to take the tots out. Don’t turn the oven off, just yet. You’re going to take that .5 cup of cheese we set to the side and sprinkle it over the top of chicken tots, before placing it back in the over for 3-5 minutes. Make sure the cheese has melted, but isn’t burned. Drizzle with ranch, sprinkle the pepperoni, and dollop the sour cream. Garnish with the scallion onions and this recipe is ready to go! For me, this easy recipe was a lot of fun to make. It tasted delicious, and my husband was a little disappointed when he reached for another handful and found none. This easy six-step recipe will have everyone huddled-up for more. 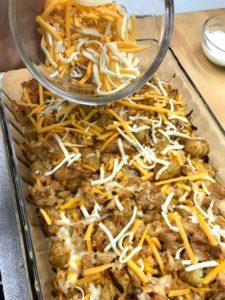 CLICK HERE FOR THE FULL HUDDLED-UP CHICKEN TOTS RECIPE! Whether you make it before guests arrive or during the big game, this appetizer is the perfect go-to for any type of get-together. I hope you enjoy making it in your kitchen as much as I did in mine. When you cook this up, make sure you share the pictures on our Facebook page! We love seeing you whip up Mr. Food recipes! What’s your favorite dish to huddle around during the big game?